The Gardens - Paddington Street. 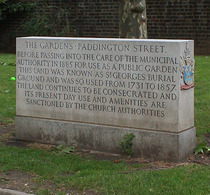 Before passing into the care of the municipal authority in 1885 for use as a public garden this land was known as St. Georges Burial Ground and was so used from 1731 to 1857. The land continues to be consecrated and its present day use and amenities are sanctioned by the church authorities. Off modern information board: gardens became a recreation ground, officially opened on 6 July 1886 by HRH Princess Louise. Westminster give the history of these Gardens here and strangely do not mention St George's. 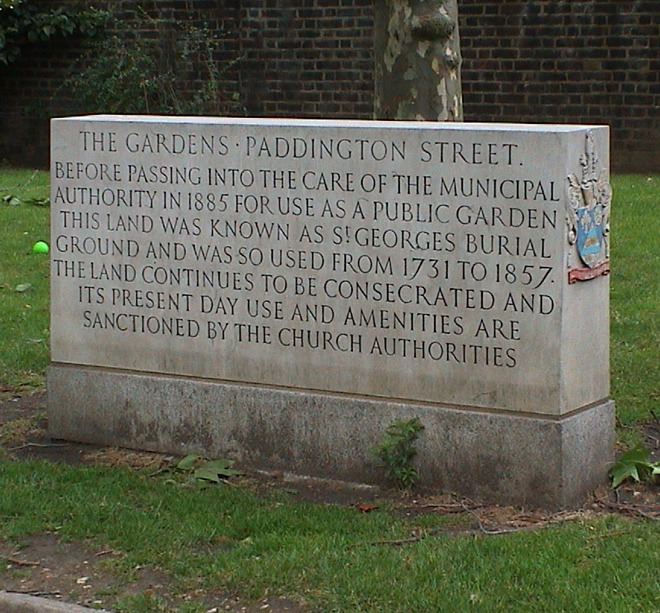 St. Georges Burial Ground was so used from 1731 to 1857. Lisa Pontecorvo, 1944 - 2008, beloved friend of Edward Square.